Craftster Community > CLOTHING > Clothing: Completed Projects: General (Moderator: meleriffic) > mittens! i whipped up these simple mittens and added some fun images to make them not-so-plain. all i really had to do initially was cut out and sew a mitten shape. easy cheesy! 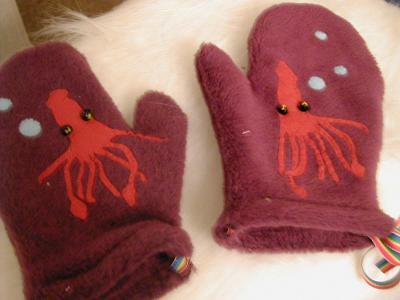 this is an adult pair... squid mittens. or squittens. why squid? who knows. baby mittens for your little animal! 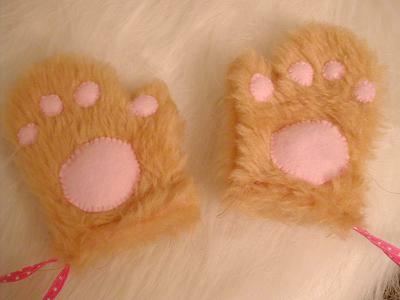 there's a little padding under the pink fleece parts to make them look a little more paw-like. Eee! Those are so great -- yay for squid! Awful Cufflinks :: Everyday stuff, just better. More projects planned than executed. PM me for a FREE vintage embroidery transfer of mushrooms (more info in profile). Those baby mittens (the "paws") kill me!!! I looooove them!!!! I would buy those if you're selling them!!! i love the squids! i'm a mitten fanatic. sadly, i live in los angeles - so i really only get to wear them about three days a year. though i do drive with the top down so sometimes at night it's cold enough (well, sort of) to wear them. i'd love to make my own pair! Oddball stuffed creatures teeming with big personality. be bigger. Also: biggerGreetings and biggerBaubles: Sentiments without sentiment. i'm glad you all like them... actually, i am selling them- if you want more details, message me and i'd be glad to fill you in. i should have a little website sometime in the near future, i'm so computer illiterate so i have to recruit help! for the squid appliques, i just cut out the squid(s) from wool felt and stitched them on with matching embroidery thread. maybe it's called whipstitching? not sure... i think it blends in well with the fabric because the fabric is somewhat fluffy and the image is flat..
biggerkrissy, you should definitely make a pair of driving mittens :) we all know mittens are delightful, and you can feel posh and fashion foward being the only one in l.a. with mittens just for driving! Oh. My. Gawd. Those paw mittens are killer but those squid ones...they look like my Mr Squidsy (a toy of mine heh). Well done they're great! absolutely fabulous! i see some fuzzy mitts in my baby's future. thanks for sharing.